Biographies of famous writers by their offspring usually have modest literary value, but this memoir is a cut above the rest. Hammett’s best-known novels, The Maltese Falcon and The Thin Man, pioneered hardboiled detective fiction, and many critics consider him a literary master. His life was chaotic. Discharged after WWI because of tuberculosis, he married his pregnant nurse and struggled to earn a living in a series of jobs from Pinkerton detective to advertising copywriter. Within a few years, however, he began to write fiction, quickly developing his distinctively spare style. His first novel, Red Harvest (1929), enjoyed great success. A year later, The Maltese Falcon was a smash hit. 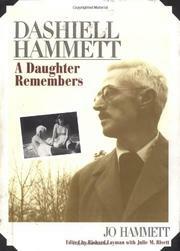 In 1931, he met playwright Lillian Hellman, his companion for the rest of his life. By now he was living apart from his family, ostensibly because of TB. But he continued to support them when he could, visited often, and remained a generous, affectionate father. The ’30s were Hammett’s golden years. Money poured in from royalties and film sales. Never one to plan ahead, he spent it even faster. When he enlisted during WWII, the Army, suspicious of his leftwing politics, assigned him to the American equivalent of Siberia: the Aleutian islands. He enjoyed his stint immensely, however, editing the base newspaper and writing the official history of the Aleutian campaign. After the war, his life went downhill. He emerged from six months in prison for defying the HUAC to the blacklist. The IRS claimed most of his income. His health declined, and when he died in 1961, he hadn’t completed a novel in over two decades. Though the author undertakes no extended analysis of her father’s works, she candidly relates his drinking, gambling, womanizing (Hellman comes out surprisingly well), and attraction to Communism. As a bonus, her account is packed with family photographs, clippings, and mementos. A valuable addition to the biography of an underrated literary figure.